Spring is right around the corner! Spring and fall are my favorite seasons. I love the warmth during the day and the long cool evenings. During the evenings in the spring and fall, many families enjoy spending time outside. Sitting on deck, working in your back yard or spending time in your screen porch are all great ways to spend a long evening. Time that you spend outdoors with family is some of the best times spent in life! During the spring and summer months we get quite a few calls for deck and screen porch designs. I enjoy designing each of these, but my favorite designs involve screen porches. There are many ways to enjoy your screen porch, from a more rustic/unfinished look to the cleaner, farm house look with its exposed, painted rafters and painted flooring. I also love a large brick fireplace as shown in the picture below! 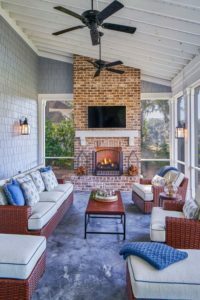 Adding an outdoor fireplace to your deck or screen porch adds warmth to those cool evenings. Another nice feature that many screen porches have are ceramic tile flooring. Having a tile floor will give your screen porch a cleaner, more finished feel. Also, by adding a high ceiling and a few ceiling fans, you can extend the use of your screen porch into the hottest parts of summer. Email us to set up a design meeting, we look forward to hearing from you!